Promotional marketing is a set of activities to spread knowledge about a particular brand, product, or service to as many people as possible with the aim to increase brand awareness and sales. How to do promotional marketing? Promotion of new products or services. It is a possibility to introduce new products and services at the market against the existing ones — a chance to find a place in the niche. Development of brand image. Brand image is when people associate a brand with a particular product. For instance, when you think about toothpaste Blend-a-med and Colgate come to your mind, when you think about tires, it’s Pirelli and Bridgestone, when you think about soccer — it’s Manchester United and Real Madrid. This promotion objective tends to create or restore the brand image and makes products more recognizable amongst the others at the market. Informing customers. Marketing promotion is vital for telling people about changes in products or brand’s policies. It also helps to describe the features and details of the products. Showing superiority over competitors. Everybody uses promotion marketing these days, so to be competitive at the market each brand has to imply its promotional long term strategy. Turning potential buyers into real customers. If promotion marketing types like personal selling, advertising, and others used appropriately, this stimulates demand for the product. Personal selling. This one-to-one communication with potential customers is the most expensive type of promotion and the most effective, too, if performed well. Advertising. It plays a crucial role in making the brands recognizable. Good advertising with a correct, targeted message will reach both existing and potential customers. Direct marketing. It is performed through social media, email and SMS marketing and, unlike advertising, it is intended to build the relationship with people who have got your brand or product on their radars before. Sales promotions. Its purpose is to stimulate purchasing and sales by giving discounts, cashback, free shipping, gifts and so forth. Public relations. This promotion type is a chance to build a positive and attractive brand image. Within this type of promotion, the marketers analyze the way people respond to a brand, find out their positive and negative associations with a company and work on the reconstruction of the brand image. Find out the needs of your target audience. Think about the people you want to promote your products and services to. If your promotion efforts are to the point, it will be easier to get your point across the audience. Decide which marketing channels to use. Define the most suitable channels to accomplish your goals. For example, SMS marketing is right for promotional purposes on the local scale. For more international outreach, companies use email campaigns, which are not only promotional but nurturing and trust-building. Besides, SendPulse offers free web push notifications, to reach customers who did not react to emails and SMS. Determine the objectives. Think about the results you want to achieve with promotional marketing. Set realistic targets, don’t try to satisfy the full list of your business goals at once. Develop a proper promotion mix. Promotion mix is a model for creating a promotional plan based on 5p’s: people, price, place, product, promotion. Before you attempt to conquer new markets, care about the critical aspect of promotion marketing — the people and come up with suitable promotion mix. Come up with your promotional message. Manage to create a word which sounds familiar and understandable for your target audience. Be humous and trendy when you talk to the youth. Be formal and reliable when communicating with more experienced people. Set your budget. Set your expectations for promotion marketing budget according to your resources and find out the cost for each channel you are going to use during the promotion. Monitor the results. Use all available tools and data to understand if your promotion is a success. Create a contest. People love to take part in different sort of lotteries, where they have a chance to win something worthful for free. Present things with your brand identity. Many customers like when companies give them bags, pens, and other stuff. And when they use those things in day-to-day life, they are continually promoting your brand. Frequent buyer card. Offer your subscribers a discount or a free item after they made a specific number of purchases. Free shipping. It is a well-working trigger to attract your audience’s attention. Make free shipping for specific products or at a certain time of the year, for instance, on holidays. Upsell. Offer upgrades and more advanced products for people who show interest in your business. Cross-sell. Propose to buy additional products like headphones or phone case if a person purchased a smartphone. Send engaging newsletters. Use email marketing to help people remember you. Make newsletters exciting and relevant to the audience. Show video testimonials. Ask your customers to leave feedback about your product or service in the socials in exchange for coffee, for example. Demonstrate your product. Show people how your product works, give your customers a try to use it before buying. 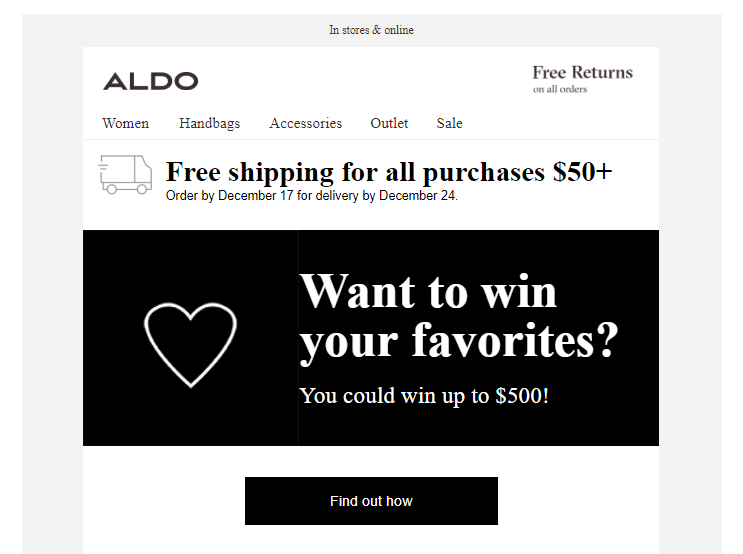 Aldo promotes its products with free shipping and a contest with the opportunity to win up to $500. 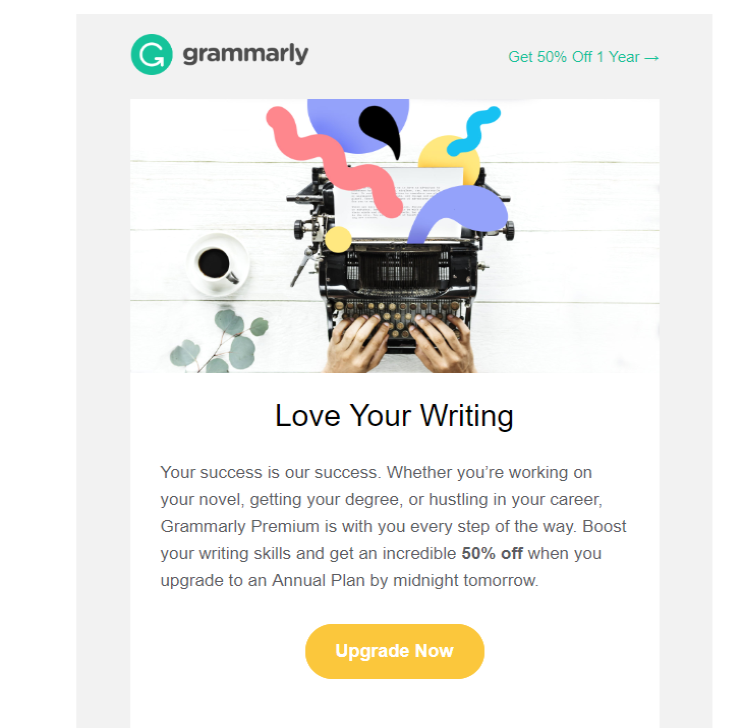 Grammarly upsells their Premium Account in a series of emails, offering different discounts and approaches. Art.com promotes the artworks by celebrating President Day Weekend with 50% discounts on [almost] everything on their site. Also searched with "Promotional marketing"
Rate this article about "Promotional marketing"
If you are interested in "Promotional marketing" you might be interested in our bulk email service.